The most popular application of rosewater is as a skin care product. It improves the dry skin and reduces the aging process of skin cells. It acts as a purifier and cleanses the skin properly. It is also beneficial of the hair and improves the blood flow to the scalp. It also nourishes the hair follicles and makes it strong. 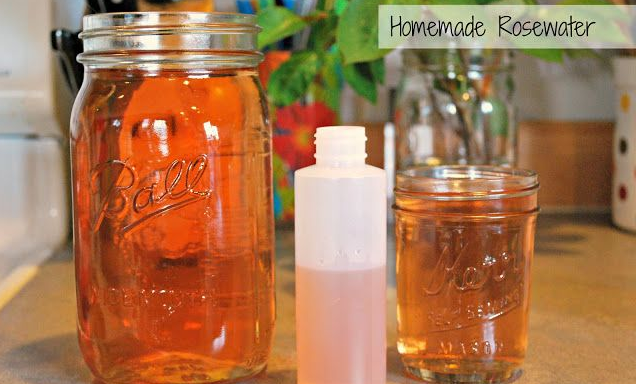 Here is a recipe to make rosewater at home. Make your own rosewater which is 100% natural and use it for skin care. Take out the petals of 5-6 rose flowers and wash it properly. Now, boil 2 cups of water for 2 minutes. Pour the boiled and hot water on the rose petals and cover the bowl with a lid. Keep it aside for minimum 30 minutes. Let it cool down and then strain the solution to take out the rose petals. Your rose water is ready! Pour it in a bottle and store in the refrigerator. Use this rose water in your daily beauty routine. Rosewater is not just a skin care product. You can use it in following fantastic ways to get rid of different healthy issues and stay healthy. To remove eye-makeup– Just combine 1 tsp of rosewater with 1 tsp of jojoba oil. Dip a cotton ball in the solution and wipe out the eye-makeup using it. Cure sunburn– Apply the rosewater on the affected area and provide a gentle massage. The skin irritation due to sunburn will vanish in no time. Treat insect bites– Take 1 tsp of rosewater and apply it on the insect bite area. You will get instant relief from inflammation. Skin toner– The rosewater skin toner is a perfect solution to treat wrinkles and acne. Take 1 tbsp of rosewater and dip a cotton ball in it. Clean the skin with this toner every night before bed time. Use as a disinfectant– The rosewater has antibacterial properties and thus can treat skin infection by killing bacteria. Natural perfume– Spray a combination of rosewater and jasmine oil on your body to get relief from body odor. Chronic headaches– Soak a towel in cold water with 1 cup of rosewater in it. Keep the towel on your head for a while to get rid of a chronic headache. In order to keep your skin free from pimples, redness and acne breakouts wash your face every day with rosewater. Use rosewater and look beautiful forever.